I don’t have a Samsung Galaxy device, but I have the iPhone XS Max, a Google Pixel 3XL, and a Huawei Mate 20 Pro. 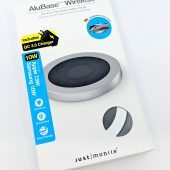 Each is capable of fast wireless charging, and so I was eager to try them out with the AluBase Wireless. There are two AluBase Wireless options you can order: with the PD/QC adapter for fast charging and without the PD/QC charger for regular 5W charging. I received the version with the 3.0 quick charger. 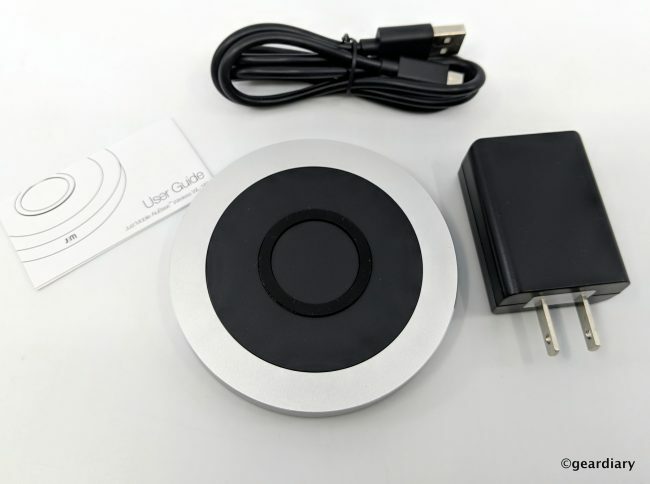 Included in the package are the AluBase Wireless charger, a microUSB to Type-A USB cable, the 3.0 charger, and a user guide. 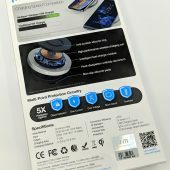 According to the user guide, in order to get fast charging, your phone’s case must be less than 5mm thick, and the case can’t have any metal in it. I was surprised to find that the wireless charger used microUSB; I’m used to seeing USB Type-C cables used for true fast charging, but okay. The Just Mobile AluBase measures 3.45″ wide and 0.45″ thick. it’s composed of a matte black plastic round edged in brushed silver aluminum with a raised anti-scratch silicone ring in the center. 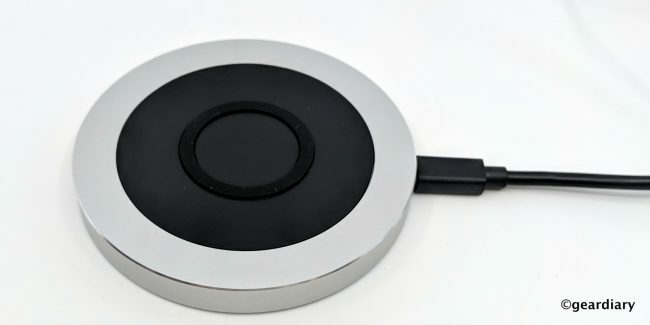 The AluBase has a foreign object detection safety feature, which means that if something metal lands on the wireless charging pad, it will shut off rather than send an unwanted charge. On the bottom, there are four rubber feet to help keep it from scooting. 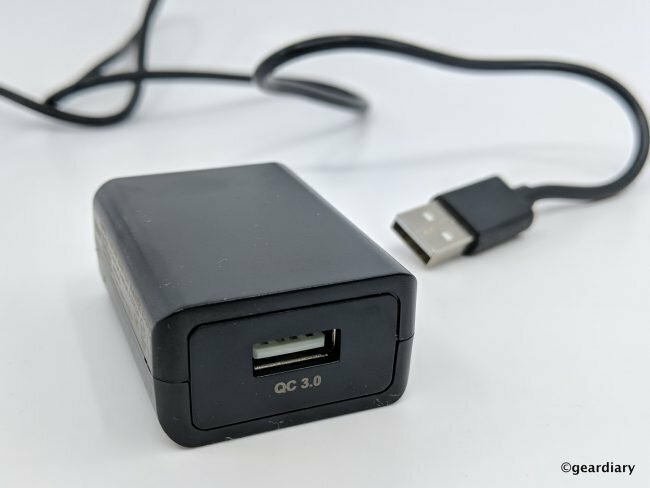 And here’s the 3.0 QC power adapter. Here’s where things get a little tricky. Unlike the on-screen “charging rapidly” prompt you’d get from an Android phone when it’s doing its thing, knowing when you are quickly charging a wireless charge enabled iPhone is a bit of an enigma. There are no special dings and no display notifications, hence you have to do a timing experiment just to be sure. If your iPhone goes from 0-50% in about an hour, then you know that it is wirelessly charging as fast as possible. Using the time chart from a MacRumors post, and starting with about 20% charge, I expected to see my iPhone XS Max hit anywhere from 40 to 50% capacity during a 30-minute charge on the AluBase Wireless; it hit 44%, so it’s safe to say it was charging as rapidly as it possibly could wirelessly – which again — doesn’t seem that great if you are comparing with the quickest wired charge, but that’s comparing apples to oranges. Unfortunately, I don’t have a Samsung Galaxy phone to test the 10W charging with. The AluBase Wirelessly can only charge a Google Pixel 3 XL at 5W (no rapid charging), but that’s due to a Pixel limitation not a fault of the AluBase Wireless. The AluBase charged my Huawei Mate 20 Pro from 02% to 16% in 30 minutes, and it went from 16% to 31% in another 30 minutes, which look like 5W speeds to me. So the lesson here is that if you want the fastest possible charging for an iPhone or a Samsung Galaxy, this would be a great choice. If you have a different wireless charge enabled phone, your results may vary — which has been the case with all of these wireless chargers! Wireless charging is more about convenience than speed right now — being able to drop your phone on a charger without connecting a wire. 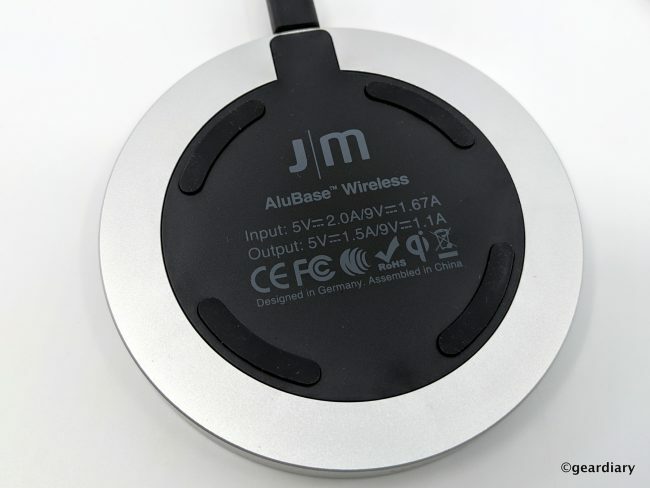 It is good to know that if you have a newer iPhone or a Samsung Galaxy device, you can get faster charging speeds with the Just Mobile AluBase Wireless than you would with some run of the mill 5W charger. The AluBase Wireless looks great, too! 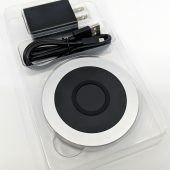 The Just Mobile AluBase Wireless retails for $49.95 with the PD/QC power adapter and $39.95 without; it is available directly from the manufacturer. Use the code ABW4GD to get 15% off for the next month.